We had The Progress Film Company using the Copperdollar Studios recently for a very important cause. Check out what they had to say about their time. I was shooting an interview as part of an online film for Love146, a charity working to end child trafficking and exploitation. I wanted a nondescript background for the interview with a rustic aesthetic and this studio was an ideal option being nearby to our production office. A colleague recommended the studio as they had filmed there a couple of times before, and felt it would be a good fit. We didn’t really have any budget with it being a charity film, but fortunately Copperdollar Studios were able to give us a lower rate for this type of work. What I liked most is the simplicity of use along with the rustic look of the space. The hayloft area that I used has a nice aesthetic with great textures that work well for video and particularly photographic work. Compared to other studios its low cost and pretty flexible – we just needed a few hours and were able to pay for just that, which made it ideal for a project of this size. 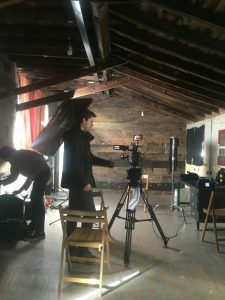 I’ve been working in the industry for several years now as a filmmaker, but I started making films in my early teens, which lead me to study film at college and then university. I built up my experience and then joined The Progress Film Company here in Brighton where I work as a director. The most rewarding part is probably getting to do something different everyday, getting to meet interesting people and learn new things you might not otherwise get exposed to, whether thats in the UK or elsewhere around the world. This project for Love146 is an example of that, something that opened my eyes to a heartbreaking problem in this country and others, that most of us aren’t fully aware of. Thank you to Stuart Hackshaw, Director, for taking the time to answer these questions for us!